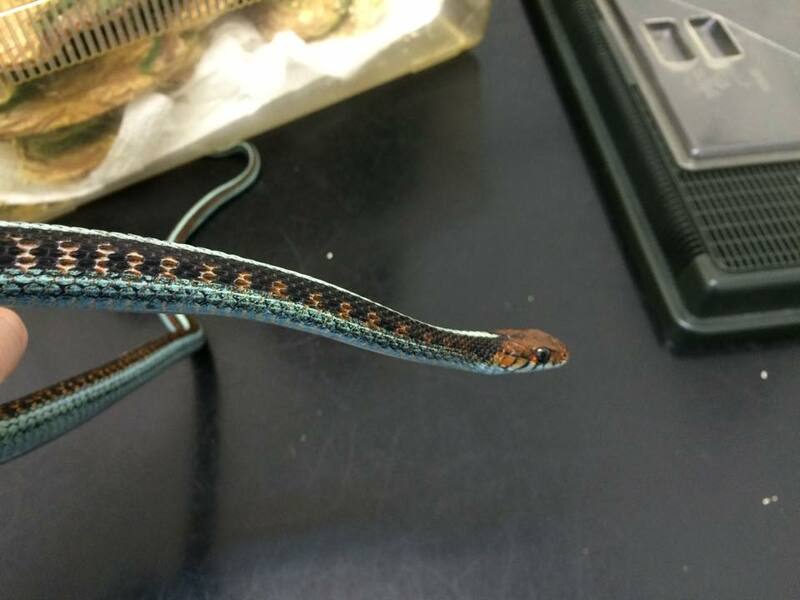 This week I was presented with a sub-adult red-sided garter snake (Thamnophis sirtalis infernalis), a North American species of snake which feeds primarily on fish and amphibians in the wild. In captivity these snakes are often fed on fresh or defrosted fish, as well as earthworms, live goldfish or other feeder fish such as minnows or guppies, and pinkies or baby mice. The snake had suddenly shown a minor head tilt and by the following day was found turning upside down unable to right itself. The owner who is quite knowledgeable on reptiles brought it down immediately for me to examine as timing is of the essence in treating reptile patients. 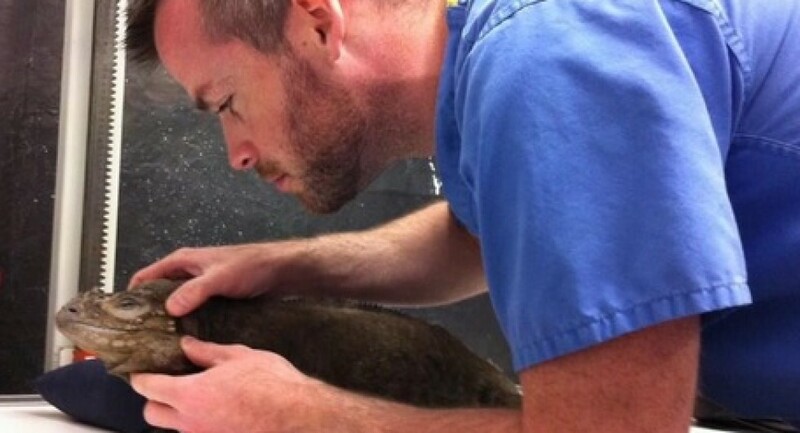 Often they hide signs of illness until a disease is quite advanced, due to being prey species in the wild, so the owner recognised the urgency of seeking veterinary treatment. 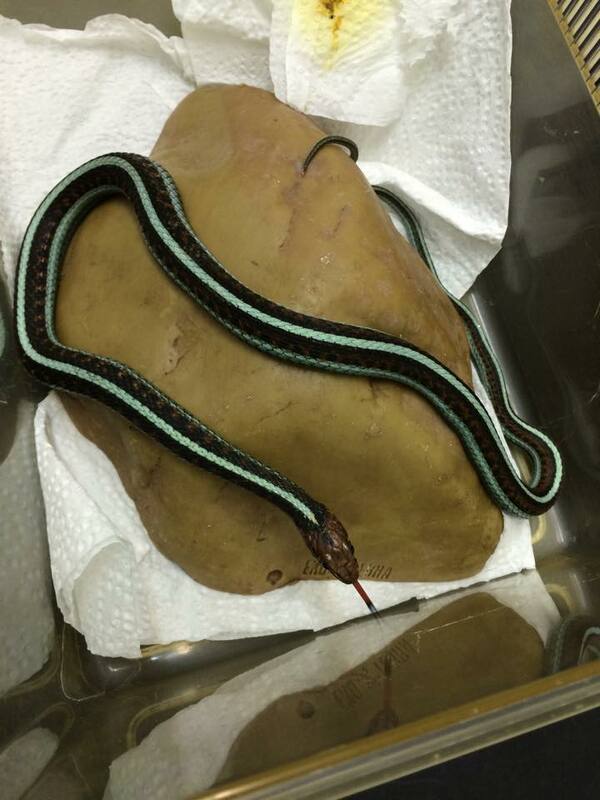 The most common differential or suspected diagnosis for a presentation such as this, a garter snake with neurological signs, is a thiamine (Vitamin B1) deficiency associated with captive diet provision. A deficiency in this vitamin leads to inflammation and destruction of cells in the central nervous system resulting in symptoms such as head tilt or wobble, torticollis (twisting of the neck), opisthotonus (stargazing), nervous tremors, incoordination, convulsions, apparent blindness and death. The issue with captive diets is that they often rely heavily on a single, readily available species of fish. Many fish species, both freshwater and saltwater, contain an enzyme called thiaminase which degrades thiamine or vitamin B1 from the diet. If such species are fed over long periods a deficiency in this vitamin occurs causing the clinical signs outlined above. There is some confusion as to the role of freezing and defrosting fish to feed to garter and other piscivorous or fish-eating snakes such as the water snakes (Nerodia spp.) as well as freshwater turtles and terrapins that rely heavily on fish based diets. In certain species of fish the naturally occurring thiaminases in the flesh are not destroyed by freezing, therefore when they are fed exclusively the thiamine in the diet is depleted and deficiencies occur. Some loss of thiamine in frozen defrosted fish can be prevented by defrosting the fish in hot water (80C for 5 minutes) which denatures the enzyme, although this has some disadvantages in that it can reduce the nutritional value of the food further. Some owners will add a vitamin B1 supplement to the food to counteract the depletion of thiamine. However, the best option for feeding fish to piscivorous reptiles is to feed fish species which have very little or no thiaminase enzyme in the first place. Many readily available and traditional food choices for garter snakes are poor choices due to their thiaminase content, feeder goldfish being a perfect example. Goldfish actually contain high levels of thiaminase despite being the most widely available feeder fish and most widely recommended for garter snake food! The owner of the snake I treated this week fed frozen defrost Smelt to her garter snakes, along with fresh trout and salmon. All of her garter snakes were very healthy and thriving on this diet so there was some confusion and disappointment as to why I thought this one had succumbed to hypovitaminosis B1. It turned out that this particular animal was quite a fussy feeder compared to the other individuals and rarely accepted a meal of trout or salmon, but rather fed almost exclusively on the defrosted Smelt. Smelt is a readily available frozen feeder fish, which contains relatively low levels of thiaminase compared with many other sources such as mackerel, goldfish or whitebait, but if fed exclusively for long periods can result in the thiamine or B1 deficiency over time. My plan for treatment was to administer high dose injections of Vitamin B1 and monitor the response to treatment. A positive response to treatment with reversal of the clinical signs confirms the diagnosis in these cases. I gave two injections 3 days apart, the second of which was today and already the little snake is doing much better; more alert, responsive with normal coordination and mobility, and no longer twisting or flipping over. Only a very mild head tilt remained, which I anticipate will have disappeared once it comes back at the end of the week for the last vitamin injection. In severe or advanced cases the neurological damage can be too severe that the central nervous system particularly the cerebral cortex of the brain becomes necrotic and the animal fails to recover. Luckily in this case the vigilant owner brought the patient in in time to save it. In future, I recommended Smelt should only be used as an occasional convenient source of food, not as a regular component of the diet. The owner will have to make efforts to introduce more variety into the snakes diet with earthworms, pink mice, feeder fish species that lack the thiaminase enzyme such as guppies and platies, or commercially available fresh and frozen fish species again that lack thiaminases such as trout and salmon and some other native freshwater angling species. It may be difficult to convert this fussy feeder onto new food sources, in which case the Smelt could be used to scent new foods until they are readily accepted.